Phylogenetic networks extend phylogenetic trees to allow for modeling reticulate evolutionary processes such as hybridization. They take the shape of a rooted, directed, acyclic graph, and when parameterized with evolutionary parameters, such as divergence times and population sizes, they form a generative process of molecular sequence evolution. Early work on computational methods for phylogenetic network inference focused exclusively on reticulations and sought networks with the fewest number of reticulations to fit the data. As processes such as incomplete lineage sorting (ILS) could be at play concurrently with hybridization, work in the last decade has shifted to computational approaches for phylogenetic network inference in the presence of ILS. In such a short period, significant advances have been made on developing and implementing such computational approaches. In particular, parsimony, likelihood, and Bayesian methods have been devised for estimating phylogenetic networks and associated parameters using estimated gene trees as data. Use of those inference methods has been augmented with statistical tests for specific hypotheses of hybridization, like the D-statistic. 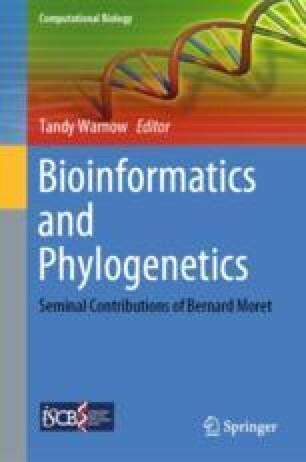 Most recently, Bayesian approaches for inferring phylogenetic networks directly from sequence data were developed and implemented. In this chapter, we survey such advances and discuss model assumptions as well as methods’ strengths and limitations. We also discuss parallel efforts in the population genetics community aimed at inferring similar structures. Finally, we highlight major directions for future research in this area. Luay Nakhleh started working on phylogenetic networks in 2002 in a close collaboration with Tandy Warnow, Bernard M. E. Moret, and C. Randal Linder. At the time, their focus was on phylogenetic networks in terms of displaying trees. This focus led to work on the inference of smallest phylogenetic networks that display a given set of trees, as well as on comparing networks in terms of their displayed trees. While the approaches pursued at the time were basic, they were foundational in terms of pursuing more sophisticated models and approaches by Nakhleh and his group. Therefore, we would like to acknowledge the role that Bernard played in the early days of (explicit) phylogenetic networks. The authors would also like to acknowledge James Mallet, Craig Moritz, David Morrison, and Mike Steel for extensive discussions and detailed comments that helped us significantly improve this chapter. The authors thank Matthew Hahn and Kelley Harris for their discussion of the definition of phylogenetic invariant methods, and Dingqiao Wen for the results in Sect. 13.6.3. This work was partially supported by NSF grants DBI-1355998, CCF-1302179, CCF-1514177, CCF-1800723, and DMS-1547433.